In 1967 Amana introduced its domestic Radarange microwave oven, marking the beginning of the use of microwave ovens in home kitchens. The sales were initially slow due to the high cost of the oven, but as prices dropped rapidly, by 1976 the microwave was present in nearly 60% of U.S. households making it more common than the dishwasher. During this same time period Pillsbury registered a patent for popping popcorn in a microwave. The early bags were not an instant success since they had numerous problems. But by 1984 the microwave popcorn bag had been perfected and its popularity took off. Today the majority of the popcorn consumed is microwave popcorn. And today the microwave can be found in every kitchen as well as most offices, hotel rooms, even RVs. Select a container - It's possible to pop popcorn in a microwave in a wide variety of containers including: poppers designed specifically for microwave use, bowls made of microwave safe materials (most glass and plastic), and even a common lunch bag. Although popcorn will pop in all of these we've had the best results, larger flakes and fewer old maids, in specially designed microwave popcorn poppers. Optionally add oil to the popper - If you want oil on the popcorn then add 1-2 tablespoons to the popper. If desired, sprinkle with salt. If you don't add oil the popcorn will be similar to that made with an air popper. Measure out the amount of popcorn kernels you plan to make and add to the popper - Most microwave poppers recommend no more than 1/3 cup of kernels which will make about 3 quarts of popped popcorn. Be sure to follow the manufacture's instructions on the maximum the popper can handle. Stop the microwave when the time between pops decreases to about 2 to 3 seconds - Remove the popper from the microwave and remove the lid, being careful not to have the steam hit you in the face. You can eat the popcorn right out of the popper or dump it into a serving bowl(s). There are numerous ways to make microwave popcorn. We'll cover the three most popular ones here: microwave popcorn bag, microwave popcorn popper, and homemade microwave popcorn. Americans consume about seventy quarts of popcorn every year. Most of that popcorn is made in the microwave oven using a prepackaged bag purchased at the store. The old fashioned way of making popcorn is no longer the most popular method. The microwave popcorn bag has overtaken the market and consumers love it. There are many brands of this tasty treat that are microwavable. Several brands are marketed to consumers and this type of popcorn became very popular. Most grocery stores have even created their own version of the microwave popcorn bag. Many people like the microwave popcorn bag because it is easy to make. You simply take the bag out of the plastic packaging, pop it into the microwave oven and turn it on for the amount of time stated in the directions. It is essential that you use caution opening the bag when the corn has finished popping. The steam can truly cause serious burns. Once you open the bag, simply pour it into to a bowl and enjoy. In fact now there is a microwave popcorn bag that when popped turns into a bowl further reducing your cleanup. Microwave popcorn comes in many flavors - butter is the most popular. Other available flavors include light butter, natural, hot and spicy, kettle corn, garlic and lightly salted. There is surely a flavor that everyone will enjoy. Making popcorn in the microwave is certainly more convenient than most other methods of popping corn. Unfortunately, many people have never had freshly popped popcorn at home. There is a big difference in the flavor of the popcorn. Microwavable popcorn can lose its flavor simply by sitting in the factory, on a delivery truck, in a warehouse and on store shelves. Heat will not only alter the flavor but can cause the kernels to lose moisture and their ability to pop. Moreover, many detractors point out the potential health risks of the numerous chemicals used in the microwave popcorn bag. For some people, microwave popcorn is a household staple. For others, it can't compare to freshly popped popcorn. Many people opt for a commercial bag of popcorn when they want to make popcorn in the microwave. However, there are others that don't like the preservatives, oil or flavorings that these products contain. There is an option for people who want the ease of microwave popcorn without all the added ingredients of the microwave popcorn bag. Popcorn poppers can be purchased for use in the microwave at really inexpensive prices. These products are usually made of unbreakable materials and are both microwave and dishwasher safe. They are simple to use and take only a few minutes to make delicious popcorn. You merely put the kernels into the container. Oil can be added if you want a better flavor. Put the lid on and in about three minutes, you have a yummy treat. Figuring out the right time to set the microwave for can be trying. It must be done by trial and error as all microwaves differ. If the popcorn does get overcooked and burns, the container will become scorched and melt. Not to mention that your house will reek of burnt popcorn which is nasty and takes days for the stench to dissipate. Many people like the fact that this method is cheaper than traditional microwave popcorn bags. A large container of popping corn is much less money than several boxes of packaged microwavable popcorn. There are other consumers that prefer to use this type of product because there is less refuse. Popping corn with a microwave popper creates less trash and recycling items. This is better for the environment. Still others like their ability to use the microwave popcorn popper to reduce the calories in the snacks they consume. 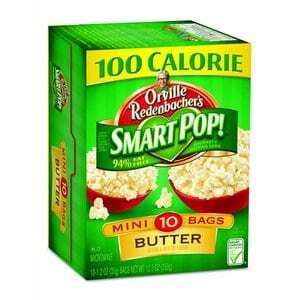 One cup of popcorn made without oil in a microwave popper has only thirty calories. This is not only great for those on diets but it is wonderful for diabetics too. In today's economy, many people are trying to find ways to save money without giving up the little luxuries that we so crave. During the Great Depression, Americans didn't need to give up popcorn and during this recession, nor do we. Making homemade microwave popcorn is a way to have delicious popcorn without killing our budgets. Purchasing a box of microwave popcorn can cost up to four dollars depending upon where you live. You can buy a large bag of popcorn kernels for less than this and it will make many more batches of popcorn. Although the microwave popcorn poppers work great you can use stuff you already have to pop corn in the microwave. You can have the simplicity of microwave popcorn for about twenty-five cents, if you're willing to take a minute to prepare it. The reward and amount of money that you are saving should be worth the few minute's time to set it up. The most popular way to make homemade microwave popcorn is by using a typical brown paper bag like you could carry your lunch in. Many folks believe that you need a special bag with a metal coated film to heat up the kernels. This simply isn't true as you will see. Start by pouring 1/4 cup of kernels into the bag. Some people like to add about a teaspoon of oil to the bag but it is optional. Similarly, if you like to use seasonings, you can add them now or wait until after the corn is popped. Fold the top of the bag over tightly a few times to seal it. Shake the bag to mix everything together. Place the bag flat inside of your microwave oven with the fold up. Turn the microwave on high and let it cook until the popping is between three and five seconds apart. This usually take about 2-3 minutes. Take the bag out and carefully open it. Use caution as you can get severely burned by the steam. Pour the popcorn into a bowl and enjoy your treat. Homemade microwave popcorn can also be made in a variety of microwave safe plastic or glass bowls you may already have. It's important that the lid for the bowl you use allows the steam to escape. You may have a bowl with a vented lid, but if not, you can cover the bowl with wax or parchment paper. Poke some holes in it and secure it with a rubber band. Put the 1/4 cup of kernels in the bowl, optionally add oil and seasoning, then microwave until the popping slows down. Carefully take off the lid and dig in - you already have the microwave popcorn in a bowl!